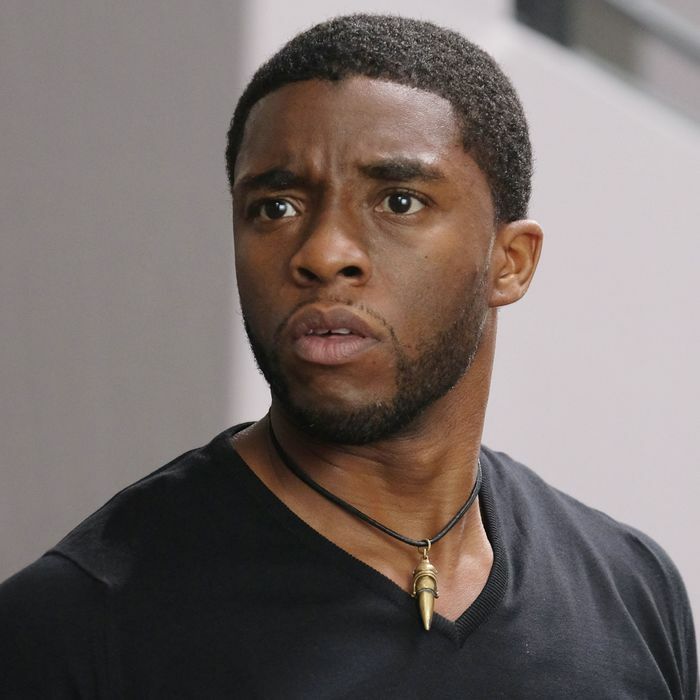 Chadwick Boseman stars as Black Panther. A U.N. meeting is held in Vienna to ratify the accords. It is there that we meet handsome T’Challa, son of T’Chaka and prince of Wakanda. He converses with one of the pro-accord Avengers, Natasha Romanoff/Black Widow (Scarlett Johansson) and tells her he approves of the accords, but doesn’t like the bureaucratic politics of the U.N.: “Two people in a room can get more done than a hundred,” as he puts it. T’Chaka joins their conversation, accepts Natasha’s apologies for Lagos, and expresses frustration that Captain America wouldn’t come to the meeting. She walks away and T’Chaka and T’Challa have a sweet moment where the elder tells the younger that he’s good at diplomacy and tenderly touches his son’s face. Moments later, T’Chaka briefly reminds the assemblage of an occurrence from the previous Avengers movie, 2015’s Avengers: Age of Ultron. In that picture, we met sinister arms dealer Ulysses Klaue (Andy Serkis), who will show up in Black Panther. In Age of Ultron, Klaue sold stolen vibranium (how he managed to get it from Wakanda wasn’t explained) to an evil robot named Ultron. The two of them got into a fight in which Klaue lost an arm and ran away. Ultron used the vibranium as part of his villainous plot and, at Civil War’s U.N. gathering, T’Chaka says the Wakandans regret their mineral’s inadvertent role in evildoing. T’Chaka saw the Ultron incident as a wake-up call about the need to do good in the world, and plans to take Wakanda out of the shadows and make it more of a part of the world community. Just as T’Chaka is telling the audience that Wakanda is proud to extend its hand in peace, a bomb blows up the building and kills him. T’Challa cradles his father’s dead body and weeps. The police suspect the culprit is Captain America’s friend and former partner, a super-soldier named Bucky Barnes (Sebastian Stan). Bucky was a brainwashed assassin for decades and is trying to overcome his programming, but the world at large still thinks of him as a criminal — and T’Challa is inclined to agree. After the bombing, T’Challa and Natasha converse once again. He holds his father’s ring and tells Nat that, in his culture, “death is not the end. It’s more of a stepping-off point.” He talks about the Wakandan gods (derived from ancient Egyptian religion) Bast and Sekhmet. Nat says Bucky will be tracked down by the authorities, but T’Challa gets up and walks away, saying, “I’ll kill him myself.” He finds Bucky in Bucharest a little while later and, clad in a high-tech black costume, fights the runaway accused terrorist with aplomb. Cap shows up during the fight in order to save Bucky from the Panther (whose identity he as of then doesn’t know). The authorities show up, stop the fight, arrest everyone, and the Panther unmasks to reveal himself as T’Challa. While riding in an armored car with Cap, T’Challa says the mantle of the Black Panther has been held to protect Wakanda for generations. He says he’s been the Black Panther for a while, but with T’Chaka dead, he now has to be the king of Wakanda, too. At a secure facility, everyone meets government operative Everett K. Ross (Martin Freeman), who’s helping to lead the task force that ensnares rogue superhumans. T’Challa is given an office instead of a cell, but told to stay cooperative. Bucky breaks out and everyone chases after him, including T’Challa, but he gets away. Eventually, all the Avengers, pro- and anti-accord alike, find themselves at an airport in Leipzig, and T’Challa shows up to fight on the pro side. They all tussle for a while, but Cap and Bucky once again escape T’Challa’s claws. He and Iron Man track the pair down in Siberia and go after them yet again. However, they soon find out that the bombing was done by a man named Zemo (Daniel Brühl), who schemed to turn all the heroes against one another. T’Challa confronts Zemo on a cliff and they have a calm talk about how vengeance can make people do terrible things. In that moment, T’Challa realizes he needs to let go of his vendetta against Bucky, especially given that he now knows the latter didn’t kill T’Chaka. He prevents Zemo from committing suicide and carts him off to prison. However, he’s not entirely on the side of law and order. Cap and Bucky are still fugitives, and T’Challa helps them escape to Wakanda, where he puts Bucky into an induced coma until a cure can be found for his mind control. “Your friend and my father,” he tells Cap, “they were both victims. If I can help one of them find peace …” Cap tells T’Challa, “Y’know, if they find out he’s here, they’ll come for him.” T’Challa says, “Let them try” while he gazes at a statue of a … black panther. Y’know, like the movie he’s about to be in. And now you’re ready to hop into your tightest catsuit and slink into the cineplex like the jungle cat you know you really are.